Over the last few years, i’ve tried to emulate their “luck”. It turns out that luck is only part of it. In order to be lucky, one also has to be prepared and to be active. Where I live in The Hague, we have a natural corridor of dunes running between the city and the beach. It’s a haven for some species of wildlife and gives them access to the city. As you will see further in this post, however, wildlife having easy access to the city does not always work out well for the animals. The following photos are a selection of my “lucky” moments when it comes to spotting and capturing urban wildlife in an image and some tips on how to increase your chances of encountering wild critters. The below image was captured at an area in the north of The Hague known as Marlot. Marlot is a piece of parkland with a combination of open grazing pastures and woodland intersected by canals. The reason I was there, was because I had read in the news that during the winter local bird conservationists feed storks to help them through the cold months. I wanted to see what all the excitement was about and I also noticed there was a lot of other wildlife around. Storks of course, but also red squirrels, great spotted woodpeckers, and kingfishers. Tip; where you find one species of wildlife, often you will find more. 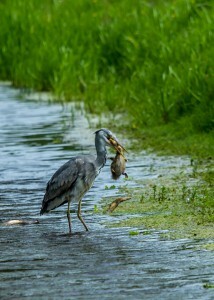 Before capturing this shot, I was hanging around waiting for a kingfisher to fly onto a low hanging branch. The kingfisher never did arrive, instead, I heard a sudden splash in the canal and saw this beast (grey heron) seize a cute fluffy little mallard duckling. It was disturbing to see, but also a rare sight – nature is not always gentle. In the late summer, I visited Hoek van Holland which is about 20kms south of The Hague. I made the trip primarily to photograph the boats around the entrance to Rotterdam harbour. It is also the location of the big car ferries that go to and from England. I was looking out over the water at a massive ferry, when I heard a commotion behind me in the direction of a nearby seating area. 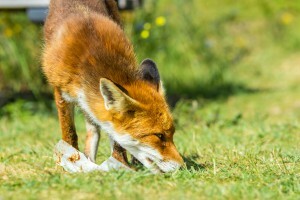 The cause of the commotion was a young red fox hanging around the people and licking ice cream wrappers lying on the ground. 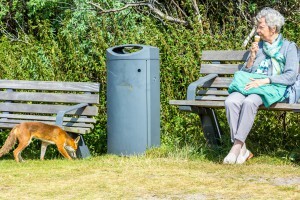 It was in the middle of the day, (a terrible time to take photos usually) and the fox had little to no fear of people. I guessed hunger was making it so bold. I had time to shoot it with my 70-200mm lens, then he stood still long enough for me to change to a 17-50mm wide angle lens. Tip; be inquisitive and notice things happening around you. While not classed as wildlife, they are indeed a fun sight to see during a walk in the dunes. These two, a mother and calf, are taking it easy in the October sun. 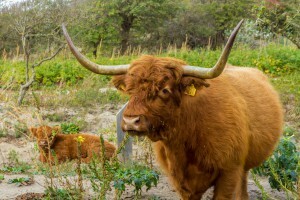 The city uses the cattle to eat the plants and trees that are harmful to the dune environment. This allows the right kinds of plants to thrive and thus attract more wildlife. 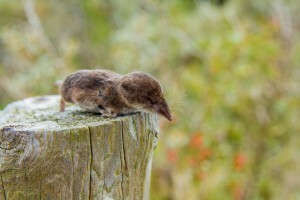 I’ve never seen a shrew in the wild before. 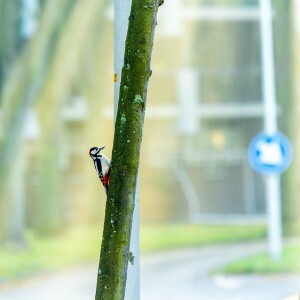 So I couldn’t believe my luck when I spotted this one on a post near a walking path in the dunes near Kijkduin. When it didn’t move as we got closer, I realized it was dead. Shrews, I am pretty sure, have a short life span. And I reckon this little guy had had a busy mating season and wasn’t fit enough for the cooler autumn weather. Tip; keep a camera with you, even if your just going for a walk. 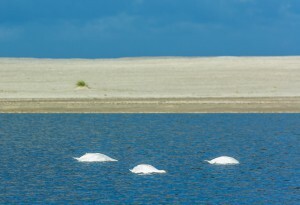 These three swans (which were part of a large family of seven) are feeding in a fresh water lake not 10 minutes drive from The Hague near the town of Monster. The lake is not in a desert, but rather in a man-made sandflat created to counter the effects of rising sea levels. Known as the Zandmotor or “sand engine”, it was formed when ships pumped thousands of tonnes of sand onto the coast. After a time, a lake formed and the local wildlife started using it for feeding and sanctuary. Tip; keep up to date with the developments in the land around where you live. Things change. One morning I was out getting some exercise by taking a walk on the beach and I saw what I thought was a log. As I approached closer, I smelled that it was something other than a dead tree. 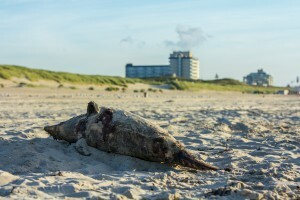 It was a dead porpoise, or as they call it here, a bruinvis. Luckily, I had my camera with me and took some images. After speaking with a local birdwatcher who was nearby watching for migrating wildfowl, I learned that the fishermen often catch them in their nets. They cut off the tails to free them and then cast the body back into the sea. I later checked to see if this “bruinvis” had a tail and saw that it had been cleanly sliced off. Often being in the city and walking its outskirts gives one an opportunity to see how man destroys much of the nature and wildlife trying to share the same space. Tips; be prepared with your camera, talk to the locals to understand things better, and pay attention to details in the landscape. One morning I got up early and went for a walk in the nearby woods. When I came back home, I noticed this object lying on the road. 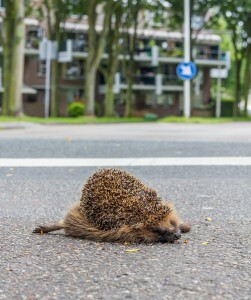 To my sadness, I saw it was a large hedgehog that had been hit by a car. Hedgehogs have always been in this area, but because of the hedges often being removed by residents and councils, more roads, and house yards being covered in concrete, there are fewer places for them to shelter and feed. They are in serious decline. This one pictured managed to fatten up over the summer but unfortunately, it will never see another summer again. 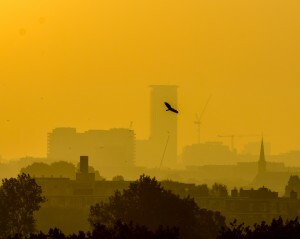 One morning, I was climbing a nearby sand dune near the beach to photograph the city skyline at sunrise. To my delight, I saw a seldom seen migrating marsh harrier flying the dune line and skirting the suburbs. A marsh harrier is a predatory raptor and on this occasion it was in hunting mode. I managed to snap it just as it was bracketed by the tallest building in The Hague (the Strijkijzer) or the “iron” (in English). Tips; get up early and stay out late. Find out if there are migration paths near where you live.